There were no trappings of a party going on last night on Manhattan’s Upper East Side—no sign on the buzzer saying, “this way,” no music blaring in the hallway to indicate there was anything interesting going on inside 1C. But in a small apartment with a cramped, hot kitchen, a chef with a charming Italian accent was already preparing a meal for me and nine other people he had never met. 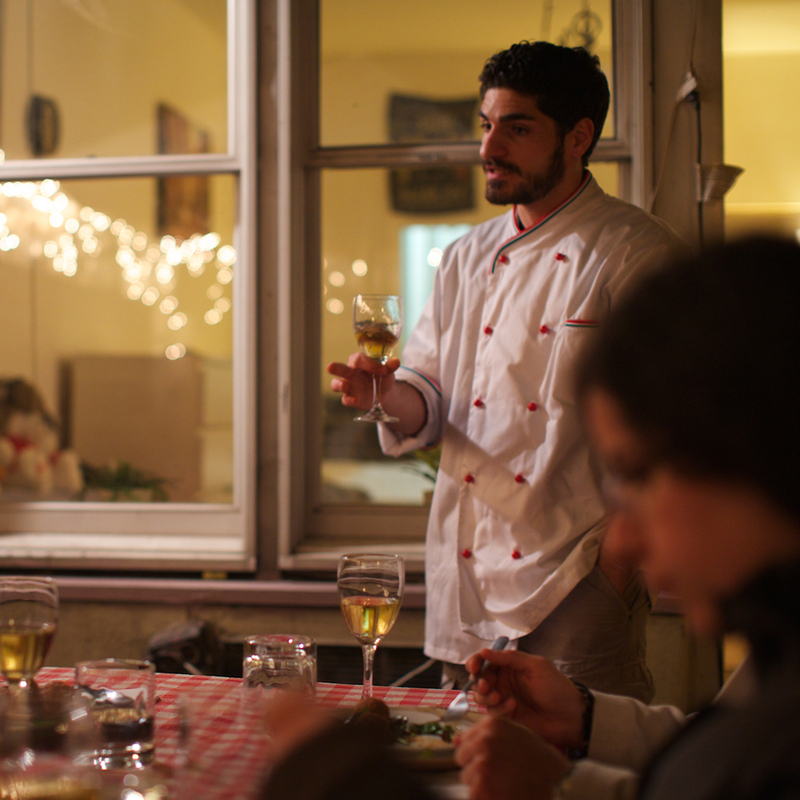 The hosts, Marco and his girlfriend, Dalila, are part of a growing community that throws dinner parties for strangers through a website called Feastly. Feastly vets all its hosts. Not all chefs are professionally trained like Marco, who attended culinary school in Italy and cooks at an NYC pasta bar, but the company aims to connect hungry diners with unknown talents. Last night, for the theme Feast of Seven Fishes—an Italian tradition usually held on Christmas Eve—Marco put his own spin on classics like stuffed squid (which he cooked via sous-vide) and lobster lasagna made with hand-rolled saffron noodles. He came up with the recipe for lasagna one night when Dalila invented a few too many guests for dinner and Marco was concerned about plating 15 dishes of pasta. He's a firm believer that the best dishes are born out of mistakes and improvisation, and we have to agree. The result was fantastic. Sure, it's possible that you could end up with a room full of duds, but it's more likely that you'll connect with a group of interesting or at least mildly adventurous people. Over the course of the evening, I learned how one gets to be a cheesemonger, that the guy sitting next to me once stood onstage with RZA during a concert at the Giza Pyramids and that two others who had never met before both had friends who went to prom together in Naperville, Illinois. I’ve lived in two of the biggest cities in America, and good food isn’t particularly hard to track down—but finding people you actually want to eat it with can be. Marco and Dalila’s party managed to offer both. If you’re interested in eating a good meal with a bunch of strangers, prices on Feastly range from free to $100+, so there’s something for every budget. And if you’re interested in eating with Marco and Dalila and trying the lobster lasagna for yourself, they’re actually hosting another NYC Feast of Seven Fishes in the near future.